Crunchy, spicy and super delicious were the comments my crew used to describe these chicken bites. This is another one bite dish using Chick-fil-A Nuggets. The count on nuggets is about a third of the small tray off the catering menu. Simple ways to take the best nuggets in the world and use them in other recipes. How much easier can it get? Made per the above directions, these bites are KICKIN’ hot. Our little ones did not care for them but the older crew ate them up! I tried them dipped in ranch, avocado lime and Chick-fil-A Sauce… oh yeah! Nuggets are just one of the many items available on the Chick-fil-A catering menu. Looking for other ways to take advantage of the Chick-fil-A catering menu? Checkout all the awesome recipe ideas on our Pinterest board! 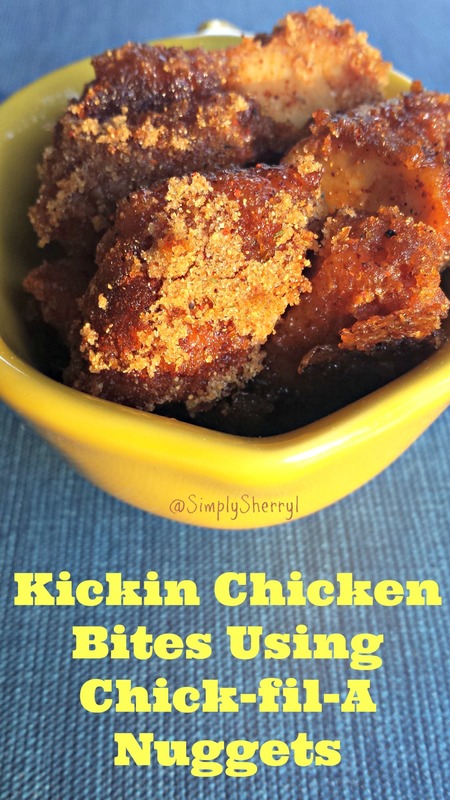 Follow Simply Sherryl’s Chick-fil-A Recipes on Pinterest. Wow! These look so good. I Love the idea of the brown sugar and cayenne together! YUM!